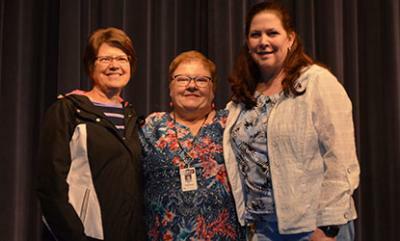 Three of the four Glencoe-Silver Lake staff members who retired at the end of the school year. From left to right are Patty Fleischacker, elementary teacher; Dawn Peterson, administrative assistant to the superintendent, and Sharon Iverson, high school English teacher. Not pictured is Duane Stensvad, special education teacher and paraprofessional.